Do I have to pay the set up fee on reprints? For on-demand printing, does the price per copy remain the same regardless of how many are printed? What is the additional charge for rush work? 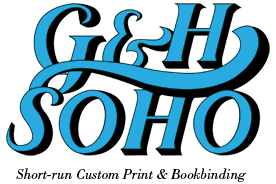 What kind of work does G&H SOHO do? We feel that being up-front with costs is one of the most important ways to gain your trust and promote a long-term business relationship. Unless there have been changes on a reprint's specifications you will never have to pay the set-up fee again. In addition, we archive all our jobs and never charge an storage fee. Yes, once you pay the set-up fees, the running rate for each copy is the same. We do not charge set-up fees on reprints unless you make corrections from one printing to the next. That's why we encourage our clients to print fewer books than they think they need. We can always go back to press and reprint your book, generally within a week's time. Numerous management studies have shown that publishers lose much of their profits by overprinting and storing books for lengthy periods. Often, these books never sell. Many of our clients have told us that our system saved them money in the long run by printing fewer books in the short run. Well, since you are here, we would suggest you use our online estimate request form. Otherwise, the best way to ensure that we get all the information necessary to do an accurate quote, is to give us a call and speak with one of our customer service representatives. Obviously the answer to this question will vary depending on the nature of the job. On-Demand printing: We usually allow 5 working days to delivery of proof and then 5 working days from the time of OK to delivery of a perfect bound paperback book. Generally, allow an additional 7 working days for a casebound book. For a reprint, allow five working days to print, bind, and ship a paperback order and approximately 10 working days for a casebound book. If you require a quicker turn-around, just ask! It's rare that we cannot meet a date, no matter how short. “Bound Galleys” is a bit of an archaic term. Initially, in the days of traditional printing methods, bound galleys we just that: galleys [from the typesetter] cut down and bound simply. Their purpose was to get advanced pre-publication versions of the manuscript out to reviewers. These bound galleys often differ in size and look from the actual production book. The copy is usually uncorrected after typesetting and may lack illustrations. It will usually carry, on its cover, information that is useful to reviewers, wholesalers, and retailers. Printed quantities can vary greatly depending on the market. A proof is a way of ensuring that we have set your type accurately and that everything is positioned according to your requirements. Typically, we will produce a proof that will be sent to you online or as printed copy. On multiple color jobs, we can produce a color proof on one of our digital color printers to show how the colors will appear. There are always exceptions, but there is usually no additional charge for rush work. Our plant is organized to produce work quicly and accurately. Have a look at the "Products and Services" section on this website. But, if you don't see it there, ask us. We often surprise ourselves with what we can accomplish.